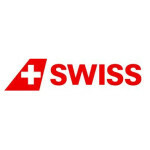 SWISS International Air Lines passengers departing from selected European countries are invited to purchase an EUR300 flight ‘voucher’ at the discounted price of EUR250, valid for use on SWISS intercontinental and all Edelweiss services until 31st March 2014. The vouchers are personalised and can only be used by one passenger per booking – although there’s nothing to stop each passenger making a separate booking to maximise the benefit of the vouchers (noting that other benefits of a single booking reference may be lost in such circumstances). Only one voucher may be used per booking, although individuals may each purchase up to 4 vouchers. Vouchers must be purchased by 14th October 2013, and redeemed by 30th November 2013. Tel Aviv and Cairo are the only intercontinental destinations excluded from redemption. The vouchers are valid for flights originating in Italy, Spain, Germany, Austria, Romania, Serbia, France, the Netherlands, Belgium, Luxembourg, Greece, Portugal, Turkey and Ireland. 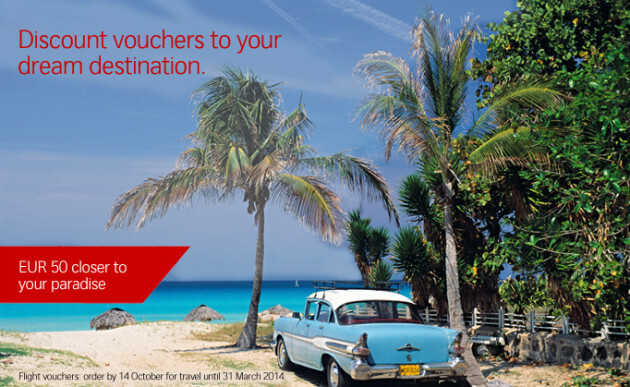 For full details and to buy vouchers, visit SWISS.com. The reality, almost always, fills me with horror. The interminable Economy Class flights on previously unheard-of airlines, between airports that have no more than a passing connection with the city that they’re reputed to serve, staying at lodgings bereft of all but the bare minimum number of dull twinkles of unofficially-applied stars, and transit between them in clapped-out old charabancs which probably served as troop transport during the Crimean War. The only once-in-a-lifetime thing about the whole venture is that the unwary will be charged such an inordinate sum to suffer this torture, that the combined stress of enduring it, and then paying off the resultant credit card bill, will probably mean that they die soon afterwards. However, and I am considered but assured in my contention of this, the five weeks that GrandfatherContinentalclub had just experienced, at 86 and a half years of age, do indeed constitute the trip of a lifetime, and it was my sincere hope that the final leg of the trip would be a fine and fitting finale. So, if any airline, from any country, could possibly pull off the reliable delivery of a quietly but assuredly promoted service, it would be SWISS, from Switzerland, with their discreetly measured First Class. Well, I tell you, I damn well hoped they would. Check-in opens 180 minutes prior to departure at Narita, with most Star Alliance airlines, including SWISS, sharing the dedicated Southern half of Terminal One. At the far end, beyond the Business Class-branded desks, is the Star Alliance First Class check-in area, policed by an ANA-uniformed member of staff, but in no other way different from the other desk areas – except, perhaps, for the lack of queues. In a show of distinctly un-Japanese (or Swiss, for that matter) deviation from process, check-in was actually open 201 minutes prior to departure (and possibly earlier), so we were saved a wait and were able to present ourselves immediately. Despite the otherwise standard appointments of our surroundings, it was almost immediately the level of service that defined the experience. Firstly, upon confirmation of identity, our check-in agent presented a welcome letter from SWISS. Inside, personally-addressed details regarding that day’s flight, including the Captain and Maitre de Cabine’s names, weather conditions in Zurich and other pertinent information. As an almost no-cost burden on the airline, it was an excellent first impression. Our agent completed the check in and issued the boarding cards for Zurich and onward to Manchester and enquired whether we would prefer to use the ANA or United First Class Lounges. After a brief discussion, she advised that the ANA Lounge, though further from check-in, would probably be better as it would be closer to the departing gate. She winked and grinned when I asked whether it might also be finer than the United one…. Rather than issue directions however, and once the formalities were complete, she simply got up from her chair, went and found a wheelchair, fastened GCC in it and off we all set, together, for the Lounge. Wait for that to happen in the superficially much classier First Class Check-In Area at Heathrow’s Terminal Five, and you’ll be waiting a very long time indeed. Safely navigated through the crew and assistance lane at security and past United’s First Class Lounge, it was indeed a bit of a walk to the ANA Lounge Complex – the First Class and Business Class Lounges being arranged one on top of the other at the far end of the airport pier. Our check-in angel wished us a pleasant flight and made arrangements with the dragons for a Lounge-to-gate pusher, and we settled in to watch a Singapore Airlines A380 being prepared for departure right outside. Within seconds, a member of staff came to take a drinks order, laying down some nibbles and a hot towel as she did so. The ANA F Lounge is not grandly appointed, but it’s a quiet and pleasant place to watch the apron action and enjoy a morsel of food. There is a dining area serving a limited menu of Udon Noodles and, adjacent to that, a buffet area. At 8am, the selections were limited, albeit of mostly delectable quality – sushi (of course), some very dainty sandwiches unappealingly shrink-wrapped in cling film, fruits, yoghurts and pastries. The bar area, for later in the day, was reasonably comprehensive although champagne is a notable stranger to the ANA offering. The lounge is adequate, certainly not comparable to Cathay’s First Class lounges in Hong Kong, the Qantas F Lounges in Sydney and Melbourne, or BA’s Concorde Club Room at Heathrow T5, but the service was more efficient than BA’s and the view better than Cathay’s. Whilst it may have added nothing in particular to the experience, the ANA Lounge certainly didn’t detract from it – and the peace and quiet was very welcome. In what seemed like very little time anyway, the next pusher arrived to take us down to the gate which was, as we’d been assured, not all that far away even if it was back in the direction from which we’d first come. With no delay at all, we were pre-boarded and entered the immaculate A340-300 through Door 2L, the second from front on the port side. Met by the Maitre de Cabine, we were escorted forward and shown to our seats, 1A and 1D, which between them constituted 25% of the entire cabin of just eight seats. 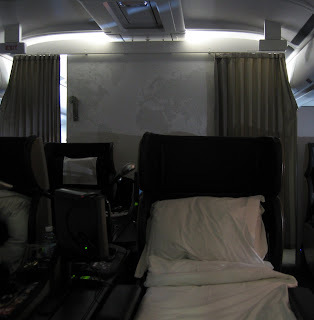 Almost equally as interesting was that the use of Door 2L allowed us to pass through the furthest forward of the two Business Class cabins, which seems to possess that slight exclusivity of the upper deck of a 747 – having just a pair of rows of 2-2-2 seating, but here on a single deck aircraft. The much larger rearward cabin, with six rows of Business Class seats, looked just as smart, but a good deal less private and a mental note for the future was made. Back in the First Class Cabin, seven of the eight seats would be taken, but two dedicated crew members plus the Maitre de Cabine ensured that no-one was ever kept waiting for more than a moment. Draw-corded fabric pouches containing smart pyjamas were handed out, along with generously proportioned Bally toiletry bags containing La Prairie products, and pairs of slippers. Each seat had also been pre-laid with a wooden coat hanger so that jackets could quickly be stowed. Pre take-off newspapers and drinks were then offered from a selection laid out at the forward bulkhead, which included a very palatable 1998 Pommery Cuvee Louise. Once airborne from Tokyo, the crew were quickly up from their seats to lay out a grander drinks display again, and to offer further refreshment to their charges. The selected aperitifs were accompanied by a small platter of canapés, presented and individually described in some detail by the crew. The second of these canapés was, despite the elegant French description of fondant potato whipped with fresh cheeses and wrapped ‘en croute’, a perfectly bite-sized facsimile of a Greggs cheese and onion pasty and, therefore, absolutely delicious. A screen, above the bulkhead drinks display, cycled variously through the Airshow in-flight mapping and also SWISS information and promotional videos, the latter of which included a feature on the forthcoming ‘New’ First Class product. On many other airlines, this could be a risky endeavour, resulting in the occupants of the soon-to-be-superseded seats feeling short-changed. No real danger of that here though, as the new seat will merely be an evolution of the existing product rather than a wholesale redesign. It will, however, address the few obvious short-comings with the existing seat. The first of these is privacy – especially in the centre pairs. What looks like a partition that should rise between these seats is, in fact, fixed and the outboard single seats have no real screening to speak of other than their cocoon backs. The second is that, despite the length, width and shape of the SWISS seat being extremely generous, bigger in all directions than British Airways’ First Class for example, the back rest is actually quite short. For sitting, slumping and dining then, the ample proportions are actually largely irrelevant, when the BA seat is, for me, ultimately more comfortable. So, SWISS ‘New’ First will have far more privacy and a redesigned seat cushion and back, but will remain in the same footprint and layout as that currently employed. A table lamp and much larger TV screen will complete the upgrade, but will hardly leave the existing product in the shade. The SWISS crew had already shown themselves to be charming and professional, but it was as the meal service began that their pride in their job began to really shine through. Our assigned crew member had flown with SWISS, and before that Swissair, for a combined total of 23 years – and it clearly showed. In particular, she seemed to tune in very quickly to the fact that this passenger was both interested in and keen to enjoy the service, and she responded to this with even greater enthusiasm to show-off the best that the airline had to offer. And what a canvas she had to paint on, with an absolutely enormous dining table emerging from the side console, to which a fellow diner could more than comfortably have been invited and seated on the expansive ottoman. Laid with white linen, first up was an amouse bouche of fine sushi, served with soy and wasabi. Even with the addition of glassware, cruet, cutely-doilied charger plate, and individual napkin-wrapped bread basket to the table setting, there remained acres of space. The starters, next, are served from a low, linen-draped trolley from which passengers may select their preferred items. Not this passenger, for whom our superstar stewardess insisted that I try everything, even if it would take two plates. On then to the salad service – again from the trolley and with the opportunity for leaf, additional ingredient and dressing selection – served seat-side. Throughout this culinary onslaught I maintained my loyalty to the Cuvee Louise, but the Wine List was beckoning as the salad bowl was cleared. From a choice of four main courses: Beef, Tilefish, Ricotta Cannelloni or a Veal ‘Special of The Day’, it was to the Fillet of Beef with crushed black pepper and a rosemary sauce, sautéed spinach and leeks, baby carrot and saffron tagliatelle pasta that I leaned. Beef duly served from the galley, our crewmember invited a decision on which wine to accompany it with. Given that the wine list showed just three red selections, but the display ahead four, and with the relatively unusual opportunity to sit quietly and undisturbed to sample wines, I asked if a little tasting might be possible. Four glasses were enthusiastically collected from the galley and, from left to right, a 2006 Merlot Riserva la Prella from Switzerland, a 2004 Chateau Smith Haute Lafitte from Bordeaux, a 2005 Excellent Blauer Zweigelt, Cabernet Sauvignon and Merlot blend from Austria. The fourth, I am ashamed to tell you, I cannot remember, but the most important thing is that the Swiss Merlot turned out to be the star of the show from the quarter-glass tastings. Needless to say and despite my protestations, it was insisted that this choice be revealed to the crew and that glass topped up fully and then repeatedly. Cheese to follow, and here we are back to trolley service and a quintet of Bedretto, Formagello, Fumello, Quadratino and Gruyere, accompanied by plum-sized grapes, dried apricots, chutney and 20 year old Calem Port. Less dedicated flyers might have flagged at this point but no, this one sallied-forth towards dessert and, though the chocolate mousse made a valiant attempt to find its way to the table, it was the baked apple tartlet that prevailed, along with a little vanilla ice cream. So it was perhaps lucky that the seventh course, after all that, was limited to a fine Nespresso coffee and a cheeky praline to round things off. There is no other way to describe the food but superb, despite the crew’s lament that caviar is no longer offered. However it was their service that made this whole dining experience truly ‘First Class’. Despite being a daylight flight, the time difference and weight of food consumed made a dimmed cabin slumber essential. The SWISS seat reclines all the way down to meet the motorised ottoman which approaches along a little track, forming a lounger and then bed. When required, the bed itself is made up from a mattress topper which lies over the seat upholstery, a crisply covered duvet and a large pillow. The lack of absolute privacy is, to a certain extent, made up for by the wide separation between the centre seats. The bed is supremely comfortable and the increased space over the tapered (to fit into a 747’s nose cabin) British Airways First Class bed is notable around the foot area. The only discomfort was that mysterious habit of aircraft cabins heating up once crew service is concluded. It would also have been welcome had regular water replenishments been brought around, although there was a constant supply laid out at the forward bulkhead for those who felt the need to rise and rehydrate. The on-demand In-flight Entertainment System is hugely more intuitive and easy-to-use than Air New Zealand’s or Singapore Airlines’, though still not as slick as Cathay’s or British Airways’. That said, it suffered from that continuing unreliability that plagues BA’s, and it took 20 minutes to reboot 1A’s system when it steadfastly refused to play. The choice of audio and video was particularly well-judged – perhaps because there’s little domestic output for the airline to feel morally obliged to show; instead a comprehensive range of programming from around the World fills the listings and the time. With a couple of hours to go before arrival in Zurich, the lights were brought up again in readiness for an ‘Arrival Service’ which might better be described as Afternoon Tea. Table laid again, a selection of sandwiches, salads and fruits were presented on the trolley, from which a tomato and mozzarella crostini with a green salad accompaniment was chosen. To follow, the menu offered a Light Chicken Mousse or a Mixed Mushroom Quiche and, despite the description, it was decided that the quiche (and then only a half-portion) would be appropriate given the sheer scale of the earlier consumption. Our crew were most insistent that the remaining half was available to be served at any time should I change my mind. It was purely a matter of capacity however, as the next trolley approached with all manner of sweet treats, from which a goodly range were chosen and enjoyed immensely, washed down with a silver pot of tea. Delicious. The only way to reflect on this flight was with the feeling that this was a glimpse of flying in a golden age, a reminder of how it used to be with a crew who were immensely professional, capable and proud, who possessed a politesse that’s quite rare these days and yet combined it with a confidence and assurance that gave away both their experience and training. Far from being disheartened that this is a vanishing way to travel, it’s hugely heartening to see that SWISS appears to be an airline on the up, one that is in the process of refining the hard product yet further and looking to be able to offer First Class cabins on every one of its intercontinental routes, making them both a reliable and, dare I say it, superlative long haul choice. What did Grandfathercontinentalclub think as the crew chatted and then waved us away from the aircraft at Zurich? He thought it was the flight of his life – and he didn’t need a Marketing Department to convince him. Final Verdict for SWISS First Class: 9.0/10. It really is difficult to find fault. Some airlines serve Dom Perignon, Krug or caviar in their First Class cabins. Some offer completely private suites and individual minibars. One has even installed a shower. However none of those airlines has a consistent product across its entire fleet while, even with the roll-out of its latest upgrade, SWISS is reliably offering very similar service on every single one of its three-class aircraft. There’s a long-term value to that in a World where lack of reliability is one of the key drivers of customer dissatisfaction and defection. On this flight, the underlying quality of the hard and soft products: the seat, the service, the catering and the attention to detail – from the welcome letter at check-in to the coat hanger on board – revealed in-depth care in product design and development. And all this without bearded publicity stunts, super-sized aircraft or Premiership football sponsorship. 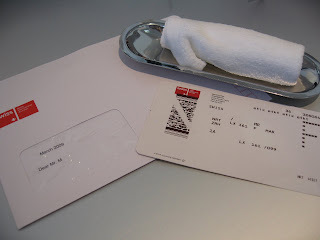 For one so averse to hype and impressed by the quietly special, SWISS First Class was an absolute delight. Right, you thought that was it then, didn’t you? Well, you’d be wrong, because there is a last little bit to add to the SWISS First tale. Had we been originating in Zurich, or continuing again in First, we would have enjoyed limousine transfers to our aircraft. However, as we were inbound to Zurich and connecting on to Manchester in Business, there’d be no limousine. We would however have access to the SWISS First Class Lounge to await our onward connection, and our (ironically, Japanese) pusher meeting us off the Tokyo flight whisked us to the automated transit and then on to the lounge with speed. The lounge is very swish in a Vorsprung durch Technik kind of way, though the Gummi Bears in carefully-aligned cocktail glasses are a charmingly unsuccessful attempt at edge-softening. At 4pm, the lounge was very busy in both the resting and dining areas. There’s a smallish buffet of canapés combined with the self-service bar offering a wide selection of premium wines, spirits, beers and champagne, as well as juices and soft drinks. The bathrooms are beautifully fitted, spotlessly clean and each loo cubicle includes an immensely handy coat hanger – all of which combine to shame those of the Galleries Lounges and Concorde Club Room at Heathrow’s Terminal 5. Unlike the Concorde Room, however, it is a far from relaxing place – obviously better than the main terminal outside – but hardly a haven of peace and tranquillity. Surprisingly, free WiFi is only available for thirty minutes per visit, by means of an access code issued by Reception. For a First Class Lounge, this seems wildly stingy. Not that we have much opportunity to feel short-changed by the WiFi, as the commendably short minimum connection times at Zurich mean that it’s not long before our next pusher appears to trundle us to the Manchester gate. And it’s here that the incalculable luxury of space that First Class affords becomes a distant memory, as the scrum awaiting the boarding announcement of this Friday evening A320 service has to be negotiated to arrive at the desk. The customarily short wait to pre-board past, we take our seats on board with the centre seat between us blocked as per SWISS’ European Business Class policy. Even so, the aircraft is absolutely packed and it’s a hard landing after the prairie-like space of the A340. The flight is, at least, mercifully short and the privations of passenger proximity accordingly not too unbearable. Service commences quickly with a hot meal, nicely presented and, in the case of the main course chicken breast and ravioli on a bed of mixed roast vegetables, is of far higher quality than similar British Airways Club Europe catering. However, there was no bar or indeed any kind of drinks service before or with the meal. I can’t eat without at least a glass of water, so this was a bit uncomfortable. At least when the bar did come, it was full-bottle service and champagne was offered pro-actively. The side salad was also largely forgettable and that curious continental concept of a lump of cheese but no biscuit upon which to place it, seemed to have found its way into SWISS menu-planning. A bread roll would have been too filling. The leather seat was comfortable enough and the service friendly, if hurried, but on balance I’d say that SWISS European Business Class was, on this occasion, less clearly impressive against its competitor peers than its longhaul First Class big brother. That said, it was perfectly acceptable and I’d not be afraid to fly SWISS within Europe again – and the priority bag tagging even worked at Manchester. Additional Verdict for SWISS European Business Class: 7.5/10. It is, of course, more difficult to shine on short haul sectors, but the basics of the SWISS service were there and it was a pleasant enough hop, despite the crowds on board. There were glimpses of SWISS attention to detail, like the mini chocolate bars handed out after dinner, however overall the meal-before-drinks service and not wholly-successful dinner itself mean that, personally, I’d still give BA the edge with their Club Europe.